Are you thinking about building an indoor pool? Here’s what you need to know when you construct an indoor pool with KB Pools. At KB Pools, we offer a wide range of pool services that will add a touch luxury to your home. We are experts in this field and can tell you all you need to know about indoor pools and the benefits they bring. What do you need to know about building an indoor pool? There will be a few questions that will pop into your mind when you’re thinking about installing a pool on your premises. Costs, construct times, and any additional facilities are just some of the important aspects that we advise you to think about. Read below and we will tell you what you need to know about building an indoor pool. Before you construct your new pool build, you need to establish your budget. With the backing of our pool architects, we will provide an estimated price of your indoor swimming pool. We will do this by taking into consideration the size and concept of your pool design. If the work doesn’t meet the standards expected in the industry, you will end up wasting additional time and money on the repairs. By employing one of our pool experts, you will be in the hands of a trusted and reliable pool builder who will make sure your pool dreams come to life with just one construction saving you the additional expenses. As a result, you will be able to plan your time wisely around the construction depending on the date our builders give. Are you interested in building an indoor pool, let us convince you further when you take a look at the indoor pool designs we have constructed in our gallery. It is imperative that your heating systems are economical to your pool construction. Trying to heat your pool all year round will have a devastating effect on your energy bills, especially if you don’t have a good heating system. We guarantee to install highly efficient heaters as well as employ a solar energy heating tactic that aims to reduce this cost. As indoor pools do not fluctuate in temperature in comparison to outdoor pools, it is important that the room of your indoor pool has good ventilation measures in place. The heat of the pool often causes a rise in humidity. This humidity will damage the foundations of your property. To ensure you don’t suffer from poor infrastructure, condensation, and rust, you need to fit a working ventilation system. For more information, about you building an indoor pool, read about our indoor pool services online. What will KB Pools will do for you? Contact KB Pools if you need to know more about building an indoor pool on 01202 518067 or email sales@kbpools.co.uk. Are you stressed out and physically burnt after every day? Does your body need to be soothed in the comfort of your own home? If so, then you will require the best Jacuzzis Bournemouth has to offer from KB Pools. We have over 20 years of experience in installing Jacuzzis into a wide range of locations throughout Bournemouth and we stock a wide range of models from the acclaimed Jacuzzi brand. The J-200 is a classic Jacuzzi choice, and it has been designed to provide users maximum comfort as demonstrated in the design of this Jacuzzi range. The range features ergonomic lines that will promote health and wellbeing for sore bodies and stressed minds. This range is available in 3 different colours and on your request we can install a hot tub with built-in whirlpool jet. The J-300 is one of the most powerful Jacuzzis available to our Bournemouth customers and will provide an unrivalled experience. The hot tub will be fitted with unique and patented PowerPro water jets in every seat, and these jets can be controlled and adjusted by the user. The J-300 range is available in a variety of seating options from 2 to 7 seats. The J-400 offers Jacuzzi users an experience that is more intense and more tailored to the needs of the individual. The seats in the J-400 range have their own water jets which the seated user can control to their tastes and needs. It is one of the best hydrotherapeutic Jacuzzis on the market, and many users have raved about the endless benefits the J-400 presents. We also provide a wide range of chemicals to help keep your Jacuzzi clean and sanitary. More information on which can be found by clicking onto this link. Why select our Bournemouth Jacuzzis service? KB Pools has over 20 years of experience in providing many homes and properties in Bournemouth with the best swimming pool and spa service. We have a built a fine reputation on supplying high-quality products such as Jacuzzi and its many ranges to many satisfied customers. At KB Pools, we highly recommend Jacuzzi products due to the level of detail and care placed into the manufacture of every hot tub. Many models feature a Tri-Fusion layered with ABS and insulation foam acrylic surface that are easy to clean and have high insulation properties which will help to reduce bill costs. If you are interested in our Jacuzzis Bournemouth service, why not pop down to our showroom in Wallisdown today where our staff will be more than happy to show you our extensive Jacuzzis range. We also have a specialised wet test area for our customers to test try out one of our spas prior to purchasing a Jacuzzi with KB Pools. For the best Jacuzzis in Bournemouth and for a great range of products, look no further than KB Pools. If you would like to find out more about our Bournemouth Jacuzzi services, please do not hesitate to contact our friendly staff today on 01202 518 067. Do you want a unique and pleasurable way to relax and forget everyday stresses? Then why not relax in your very own spa built to your needs by KB Pools. The benefits of a regular spa are endless and will also add value to your home. Our company has amassed 20 years of experience in supplying the best spas and Jacuzzis to many homes and properties throughout Bournemouth. For all of your spa supplier Bournemouth needs, KB Pools is the company for you and your property. At KB Pools, we have a diverse range of spas and Jacuzzis in stock today to meet the needs of every customer. So whether you require a spa for socialising and entertainment purposes, to having a spa for a bit of personal down-time after a hard day of working, you will find the perfect spa or Jacuzzi for your Bournemouth at KB Pools. The Unique range is a welcome addition to any home or property and will compliment any room due to the smart and minimalistic design. Products from this range are fitted with exquisite wooden panelling that will add character to any room in which it is installed. There are three ergonomic seats that come with their very own hydrotherapeutic settings that can be adjusted to the tastes of the seated person. This tub also features the overflow and emptying method which allows users to choose whether they spend their time in the hot tub indoors or outdoors. The Skyline range is famed for their wonderful construction that is very endearing to the eye due to the standout wooden panelling and tub construction. It is one of our most flexible hot tubs as it can be adapted to suit every location. It features a relaxing and distinctive wave flow feature that will make relaxing in this hot tub an enjoyable and unforgettable experience. The J-400 spa range is one of the largest and best of its type on the market. The sheer size of the J-400 range is to be reckoned with, and you will be able to socialise with friends and family in sheer comfort. A key feature of this range is the powerful jets contained within the tub that target specific areas within the body and can be customised to your tastes. Another great feature of the J-400 is the waterfall feature that not only illuminates, but projects a wonderful rush of water. There are also glass holders and headrests in the J-400. The J-300 range is fitted with PowerPro jets that will act as a refreshing and enjoyable experience whilst stimulating the body in certain areas; the jets can be adjusted to suit the needs of every user. The hot tubs within this range are available from 2-to-7 seaters. The J-200 provides customers with a luxurious and relaxing Jacuzzi hot tub experience. At KB Pools, we can supply the J-200 range in a range of colours to suit your tastes. The J-200 is an investment into your home that you will not regret as its powerful jets heightens the sensory experience, and it will soothe every part of your body. The Endless Pool Swim Spa is a by-product combination of the Endless Pool with its changing currents and a normal spa. At KB Pools, we are proud to offer our customers the Endless Pool Swim Spa, which is one of our most flexible products and can be installed into a wide range of locations. This is a product that is ideal for customers who want the relaxation benefits that a spa provides with the health benefits of a swimming pool. On your request, the current can be changed from a gentle swim to a more vigorous challenge and back again. The spa also has underwater lighting and jets to heighten the spa experience. We also provide chemicals that are specially designed for spa use, for more information please click here. At KB Pools, we are dedicated to providing our customers and their properties with the best spas and hot tubs in Bournemouth. Our company has years of experience, and we have established a reputation as one of the top spa suppliers in Bournemouth. For more information on our superb spa supplying service in Bournemouth, do not hesitate to contact our team on 01202 518 067. Do you want a swimming pool designed to suit your lifestyle and your property? Then look no further than KB Pools, as we have over 20 years of experience in designing and customising swimming pools to suit the needs of our Bournemouth customers. Swimming is one of the best exercises that you can do, and you will gain a high level of fitness in no time. For all of your swimming pool design Bournemouth needs, choose only KB Pools. 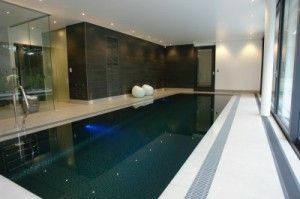 At KB Pools, we can design and construct an indoor swimming pool to suit your Bournemouth swimming pool design needs. So whether you wish for a swimming pool to be constructed of a certain material or be built to a certain length and width, our team will design a pool that meets all of your needs. Since indoor swimming pools are used all throughout the year, there will be higher energy costs as you will be heating the pool on a regular basis. This production of heated water leads to high humidity within the swimming pool area which causes problems like condensation, rust and many more. KB Pools has the tools and knowledge to design and tailor evaporation and ventilation systems to ensure your swimming pool in Bournemouth provides years of enjoyment and pleasure. We specialise in the installation of solar heating systems, high-efficiency heaters, efficient lighting and efficient pumps/motors. Click here for our specialised gallery. The outdoor swimming pool is a classic feature that will not only add value to your home, but it will provide you, your family and friends with a constant source of pleasure and activity. All outdoor pools provided by KB Pools are designed to suit our customer’s desires and the needs of their property. An outdoor pool is one of the most cost-efficient swimming pool options available on the market. You will not have to worry about dealing with costs relating to heated water and ensuring your property has a proper ventilation system. We can incorporate a vast range of features to ensure you have a pool you deserve. Click here for our outdoor pool gallery. Are you a keen swimmer? Do you find the average swimming pool doesn’t provide a challenging enough swim? Then you will need the wonderful endless pool which is one of the most exciting swimming pools available on the market. From the touch of the dial, you can have a soft gentle swim or a fast-paced swim. A key component of the endless pool is the inbuilt propulsion unit that is powered by a hydraulic motor which can move 5,000 gallons of water per minute. Customers are able to change the current by adjusting the dial that will enable you to have a gentle swim or something more vigorous on request. For our gallery, click here. If you require an outdoor pool for your property and would like something a little bit different to the standard outdoor swimming pool then a wooden pool is a great alternative. We will install your wooden pool using a patented system of dovetail joints and reinforce this with a stainless steel bar which will tighten the frame and make it more secure. Every wooden pool is supplied and reinforced with extra-thick borders that easily clip onto the pool. At KB Pools, we pride ourselves on our versatility and we can design every wooden pool to suit every customer’s needs. Every wooden pool is available in a standard pinewood, but we also provide treated red fir and tropical hardwood options. So whether your pool is above or in ground, your wooden pool will be tailored to all of your needs. Many customers are afraid of having a swimming pool installed into their home as it is a big investment and will render a room unusable for any other purpose. By selecting a movable pool floor, your swimming pool will be covered with a secure solid floor so within a touch of the button you have a swimming pool or fully functioning room. More information can be found by clicking this link. Do you want to keep your new swimming pool in a great condition? Then you will need one of our many safety covers which will be customised to suit the needs of every homeowner and their pool. For more information on safety covers, click here. Do you want or have an outdoor pool but want to use it whatever the weather? Then a telescopic enclosure is the perfect option as it will encase your pool in a protective cover that will allow you to swim in your swimming pool in Bournemouth regardless of the weather. Click here for more details on our telescopic enclosures. Swimming pools are susceptible to many diseases and dangers. It is imperative for the health of all those who use the pool that the pool is properly sanitised, and dangerous bacteria eliminated. We have a wide range of products to suit every swimming pool. More information can be found by clicking here. For the best swimming pool design Bournemouth has and for the most diverse options, look no further than KB Pools for all of your swimming pool needs. Contact us today on 01202 518 067.